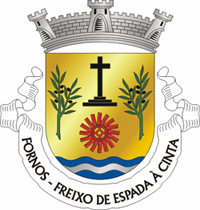 The Order has its spiritual headquarters (Sede Spiritualis) in the Church of Saint Eulalia in the Parish of Fornos (Northeast of Portugal). It was there that Dame Leonor Mateus founded the Order in 1643 and it was also there that the first 8 Grand Masters were baptized. The family and House of Leonor is intimately linked to this parish and most of its members either lived there or had a house there up until the 19th century. 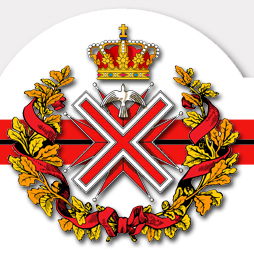 The Order of Saint Eulalia has as one of its primary objectives the preservation and dissemination of its history and its heritage. 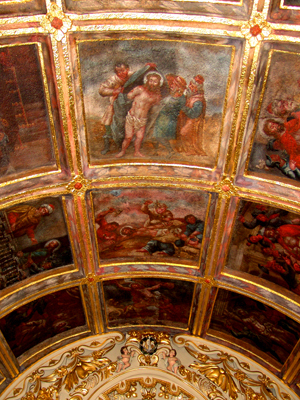 COFFERING CEILING OF THE CHAPEL OF OUR LORD JESUS CHRIST (RUA NOVA) IN FORNOS, WITH TWENTY (5X4) PAINTED (OIL ON GRANITE) CAISSONS WITH SCENES FROM THE PASSION OF CHRIST. ALTHOUGH RECENTLY RESTORED IT STILL REMAINS DIFFICULT TO OBSERVE IN THE NAKED EYE (HERE PHOTOGRAPHED WITH FLASH). 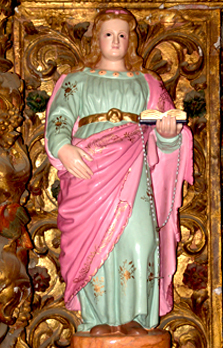 THE IMAGE OF SAINT EULALIA (OF MERIDA) THAT IS WORSHIPED IN THE PARISH CHURCH OF FORNOS, PLACED ON THE GOSPEL SIDE (LEFT SIDE) OF THE ALTAR. IT IS THOUGHT TO BE AN IMAGE OF THE 17TH CENTURY, BUT DUE TO REPEATED REPAINTS IT IS VERY HARD TO DATE RIGHT NOW. WE HOPE TO BE ABLE TO HAVE SOME TESTS DONE IN THE NEAR FUTURE. OF SAINT EULALIA OF FORNOS.